On Monday, the 30th of November, Richard Gage of Architects and Engineers for 9/11 Truth, gave his final presentation in New Zealand on the Hard Evidence Down Under Tour, to an audience of 143 in Auckland, at the Trades Hall in Grey Lynn. The event began shortly after 6pm and lasted for 3 hours. A show of hands at the beginning indicated that the audience was comprised largely of people who already were aware that the official story of 9/11 was a hoax. Only 11 indicated that they believed the WTC buildings were brought down by jet fuel and fires, while 18 indicated they were unsure. 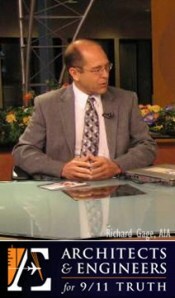 Evan Ward, who was recording the event said: “Richard Gage was very professional. The presentation was down-to-earth and in layman’s language, so the information was accessible to most anybody.” Ward, who has been investigating the evidence of 9/11 for approximately 3 years, said he also had learnt something new. What Reiersen found most convincing he said were the telling photos of all the cars in the vicinity of the WTC buildings that were covered in dust after the building collapses, that remnants of WTC 1, 2 and 7 were found outside the buildings’ footprints, including that huge girders were thrown 600 feet horizontally and were embedded in adjacent buildings, and that dust samples contained nanothermite. As Gage points out, nanothermite is a highly advanced, highly energetic material that does not come from a cave in Afghanistan. Evidence indicates that the explosive material, known as the “loaded gun” of 9/11, was developed by US government scientists, at Lawrence Livermore National Laboratories, not by Osama bin Laden. Reiersen, who walked behind the vocal debunkers following the event, heard one of them say that they had a lot to think about now. The 1st of December is Gage’s last night in New Zealand on this tour. He is flying out tomorrow morning to Japan for the start of the 7-city Japan Truth tour, which kicks off on the 4th of December and concludes on the 13th. He said he is particularly looking forward to meeting Yukihisa Fujita, the Japanese politician who has been challenging the validity of the official account of 9/11 in the political arena. He said he regards the New Zealand tour as a huge success, largely owing to the mainstream media coverage it got. Gage was on Close Up, the country’s most popular current affairs program, and on Radio NZ’s popular Saturday morning show with Kim Hill. While he said the latter interview was not very good, he believes it helped to attract a lot of attention to the tour. It also appears to have attracted a lot of attention to Radio NZ. Mark Cubey, the producer of the Kim Hill show advised via e-mail on the 2nd of November, that Hill has received over 350 e-mails from listeners regarding the interview, a representative sample of which she read out on air on the 28th of November. If the comments she read out are anything to go by, as they included: “Poorest interview I have ever heard…corporate whore..”, “Disgusting piece of trash..she should be fired,” “What a horrible stupid vile woman,” “Most dreadful interview…,” the Gage-Hill interview will likely go down in Radio NZ history, as one of their worst ever. See also "Utzon's son signs up for September 11 conspiracy theory" in the Sydney Morning Herald of 25 Nov 09 about how Jan Utzon, son of the late Joern Utzon, designer of the Sydney Opera House, is a member of Architects and Engineers for 9/11 Truth. Of course, the SMH typically attempts to trivialise the 9/11 Truth Movement and Utzon by referring to their beleifs as a 'conspiracy theory'. They neglected to point out that the alternative theory of a world wide conspiracy based in Afghanistan is also a 'conspiracy theory'. In spite of this trivialisation, the publication of this story, nevertheless represents substantial improvement upon the almost complete media blackout, including by the ABC, endured by the 9/11 Truth Movement in Australia up until now.